Can you do me solid and post pics of the catchcan installed? You think it'd be possible to mount it anywhere else besides off the front of the trans? I couldn't get a good pic of it without it being on a lift. After a few rounds of cleaning my intercooler and piping and doing pulls it seems like the combination of increased valve cover venting and new center section for my turbo have fixed the problems. I didn't end up making a pressure gauge to measure the pressure in the valve cover, but I probably will soon since I'm curious to see how low it actually is. To those who've added a vent to the intake cam / drivers side opposite the factory vent, do you see oil coming out that port? Basically, is the internal baffle as good on that side? Living in California, I've got the feeling a big fitting in the stock location / exhaust cam side is going to be an immediate visual smog fail. If I port the intake cam, I can plug it when going in for inspection, and just hook up the stock port. My goal for better venting is to help improve oil control during track days, and reduce oil leaks that seem to be coming from nowhere / everywhere. you can also remove the pcv from the back and run it straight to an open catch can, for track day. put the pcv and line back for inspection. if you still have the pcv connected to the intake manifold, it will close under boost and not doing any venting. only the side port does the venting under boost. I’ve had the side port on my valve cover enlarged to 5/8” / -10an by tscomptuned since last year now but haven’t cleaned out my intercooler until last week after installing my new BB FP Black. No oil in compressor housing yet. With the old BB Red I had it, it looked oil in the compressor housing within minutes of start up. Do you know of any changes they may have made to their chra specs? I have no idea to be honest. I know I have the Xona Rotor Billet CHRA. Not sure if that eliminated the crank case pressure issue or not. A lot of good information in this thread. I wanted to ask everyone what catch can would be best to purchase for 7-750whp on a standard twinscroll 6466 set up? I've seen the offerings from STM and seems like their standard can is not enough and the BFC needs a forward facing turbo set up, maybe the transmission mount one? Are there any other companies that make catch cans that would be worth purchasing for my set up? Appreciate the help. I really like STM's products. They're well made, and the "kits" they make for the catch can's always have what you need in them. I've installed the sealed catch can setups on a few cars and really like it. It's generally what I recommend. Why drill your valve cover if there is a solution that works. I know some people offer and swear that no shaving's are left cuz they've done a ton but for me personally I wanted to have peace of mind. I ended up with a V2 STM sealed catch can. I was getting oil through my vented TiAL bov during hard shifts, so by installing this STM catch can it fixed my issue. Just wanted to share with others. So my car has been parked for a little over 2 years now due to a blown headgasket and a lack of time. I'm finally working on getting it back on the road now. When the HG blew I was attempting to get my xona rotor bb red to stop smoking (shipped with the black 0.030" version). Back in 2016, I saw FP offered a 0.020" restrictor and asked if I could use it but was told that it was only used by GTRs or cars with unusually high oil pressure. 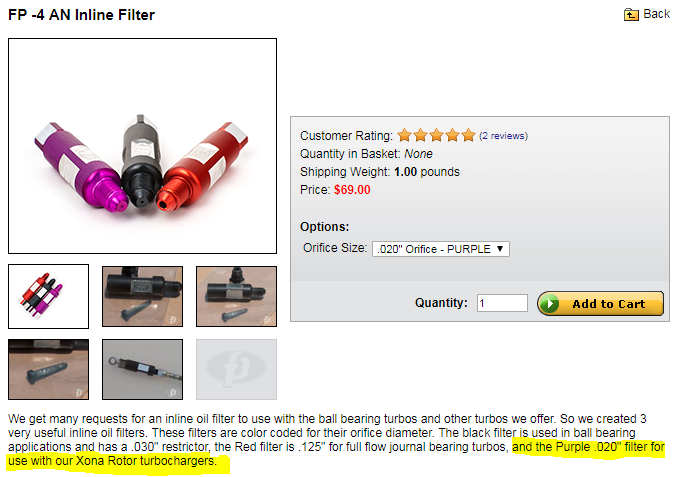 Now it looks like they've added the highlighted statement above specifying Xona Rotor turbos. I just called FP to confirm, and the purple 0.020" is now recommended for all xona rotor turbos including the stock frame green/red/black. Just a PSA for those who may still be suffering from burning oil even after swiss cheesing the valve cover. Once mine's up and running I'll update whether or not this solves the issue. You may want to also think about getting a turbosmart oil pressure regulator , and a gauge to show how much the CHRA is getting. The 4g63 makes alot of oil pressure on startup/high rpm. now you got my attention on that purple restrictor. What's then the pressure like then with that .020" restrictor? Trying to come up with a complete list of solutions. Got a BBK 3B, TScomp's old 2.4 motor and pretty high oil pressure. Also lose about a quart of oil every 500 miles. Kinda tired of the smell. No leaks, no smoke (I saw a bit once boosting when cold) and hardly anything at the bottom of the intake.